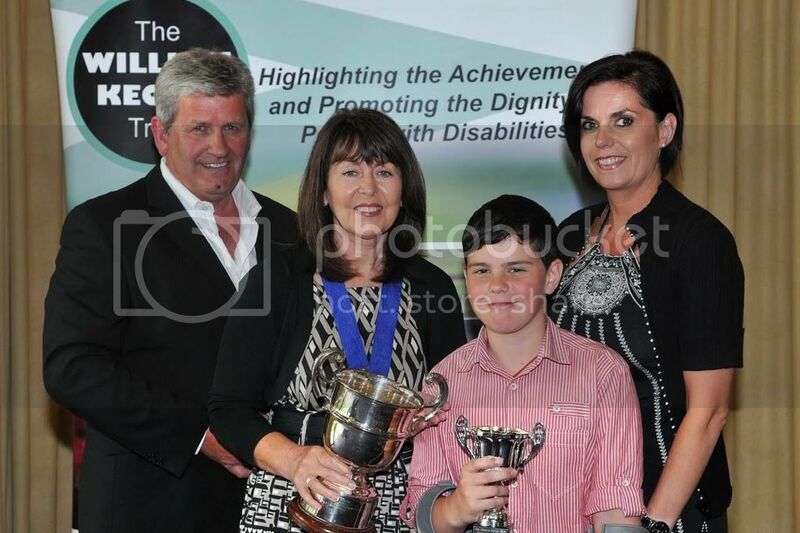 The Haldane Butler Memorial Trophy is awarded to a child or adult for exceptional endurance and determination to overcome illness, injury or disability over a protracted period of time. Haldane Butler was a young man from Omagh who fought against cancer for six years. In 1996 he underwent the world’s first triple organ transplant operation, receiving a new liver, pancreas and small bowel in a pioneering operation in the world famous St James Hospital (Jimmy’s) in Leeds. In April 1997 he had a further operation to remove a tumour from his spine, but by Christmas he was back in hospital again in great pain. He died on 6th February 1998. Haldane, a graduate of Queens University was determined to live as normal a life as possible. In spite of setback after setback he never complained. He loved life but in the end his mortal body surrendered – not his spirit. Carlo is a very courageous and determined young man. Despite suffering a serious injury at birth he has overcome his physical disability and convinced the school system that he is able to confidently cope with mainstream school. His determination to contribute to society is an inspiration. He never complains, he is only interested in solutions to his disability problems and his concern for others at his own expense is truly overwhelming. Carlo has always striven for independence. He has never sought praise or recognition and has never been nominated for any awards up until now. Although Carlo is extremely interested in everything around him sadly sometimes he is limited in his physical choices; for this reason he has become very interested in the design of computer graphics for games and is very talented in the creative and expressive parts of the school curriculum. Carlo is determined to work as hard as he can to become successful in the field of IT and wants to write software for Microsoft so that he can make life easier for other young people with limited life choices through disability. Carlo is a true Child of Courage.